Occasionally the War Prevention Initiative co-hosts and co-sponsors events that fall within our mission. For example, the War Prevention Initiative co-hosted the event “Promoting nonviolence, addressing hate & preventing global conflicts: the role of media outlets”. Featured speakers were Dr. Joseph G. Bock and Dr. Abbee Corb. 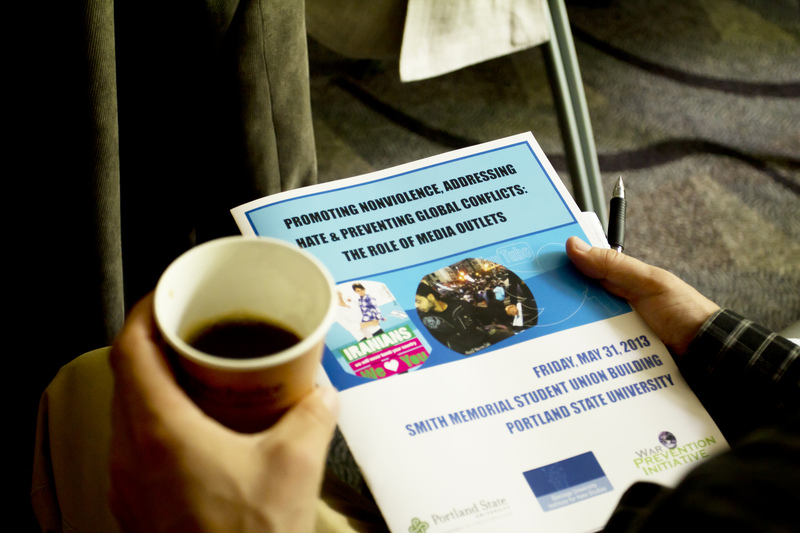 Other invitees include Dr. Kent Shifferd to present his book “From war to peace” at Portland State University; Dr. Joseph Bock for a special lecture “Engaging Rotarians in global violence prevention”, Dr. Julia Chaitin speaking about the roles of narratives in peacebuilding and peace obstruction, and militarism expert John Lindsay-Poland on “Confronting Militarism”. We were present with informational material on the Global Peace System at multiple events. Some of them are: “The cost and threat of nuclear weapons” hosted by U.S. Representative Earl Blumenauer, the Meta Peace Team’s “Nonviolent Peacemaking Skills” training event, the annual conferences of the Alliance for Peacebuilding and Peace and Justice Studies Association, or an educational forum on the Iran Nuclear Deal.